I've mentioned the quick-firing or QF gun many times here, as one of the main ingredients that went into the pre-dreadnought. This was a gun, usually of 6" caliber, which fired much more quickly than the larger guns that formed the main armament. QF guns were capable of doing tremendous damage to unarmored sections of an enemy ship, and for a time rivaled the main guns of battleships in importance. The first of the QF guns1 was the 6-pounder Hotchkiss of 1884, a 57mm weapon intended to protect larger ships against torpedo boats. 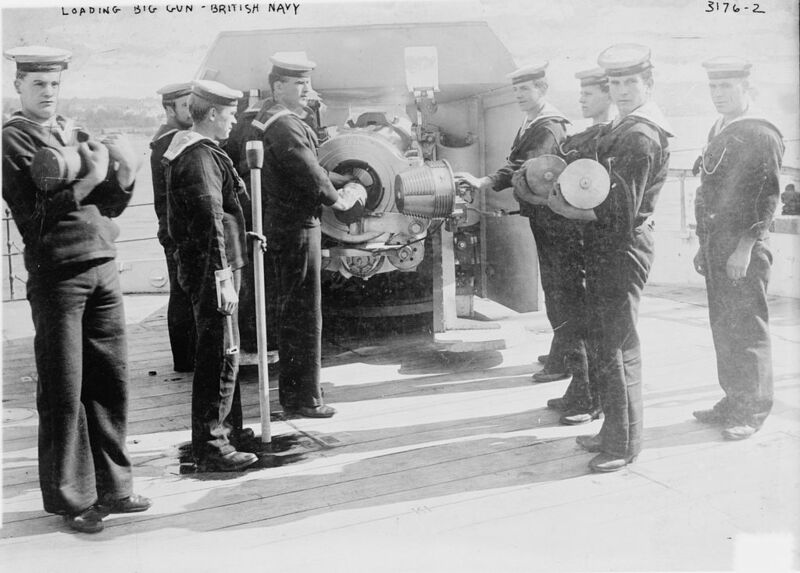 Unlike previous naval guns, which loaded first a shell and then powder in bags behind it,2 the QF 6 pdr used fixed ammunition, where the powder was contained in a brass cartridge case attached to the shell, exactly like a very large round of small arms ammunition. Because the cartridge case sealed the breech adequately and prevented the propellant gas from escaping, the breech mechanism was a sliding block, only present to provide support to the cartridge. 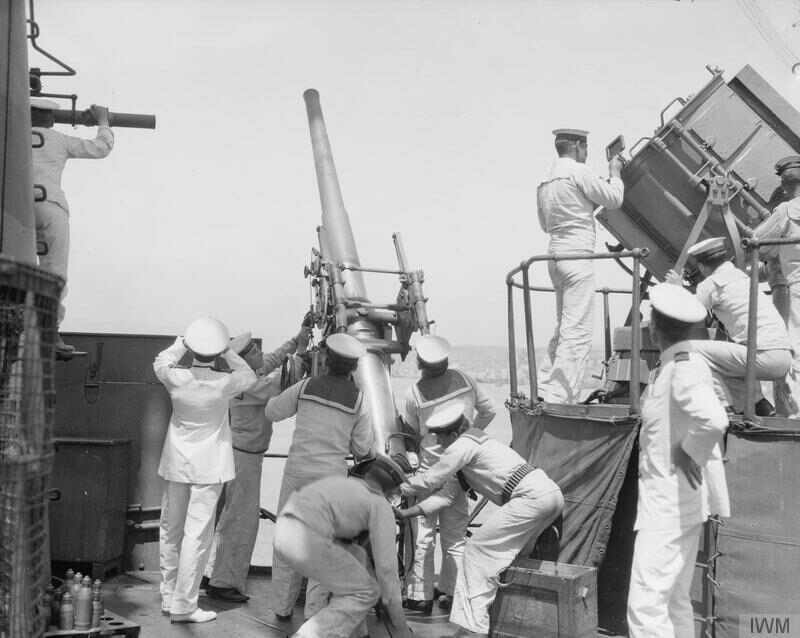 Another aspect was the recoil mechanism, which returned the gun to firing position automatically, instead of needing to be manually repositioned. All of this meant that a gun crew could pump out 20-25 rounds every minute, a significant advance over previous weapons. The obvious next step was to look at building a larger gun using a similar mechanism, one effective against full-size warships. The first of these was the QF 4.7". For some reason, the British used a screw breechblock instead of the sliding block of the 6 pdr, which limited ultimate rate of fire to around 10 rounds per minute.3 The ammunition was separate-loading. While the powder was still in a brass case, it was transported and loaded into the gun separately from the shell. 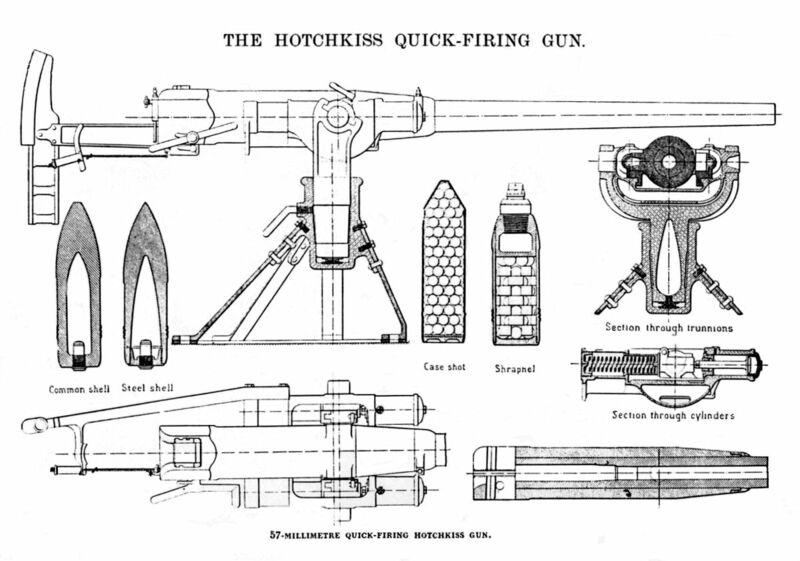 This made each piece lighter and easier to handle, which increased rate of fire. Almost all of the QF guns fitted to the pre-dreadnoughts were mounted in casemates, essentially armored rooms built into the sides of the ship. The outside plate was thick, 6" in Royal Sovereign, while the other directions (including top and bottom) were thinner, and intended to protect the crew from splinters. The gun itself was fitted with a shield, which closed the hole in the casemate and allowed the gun to traverse. 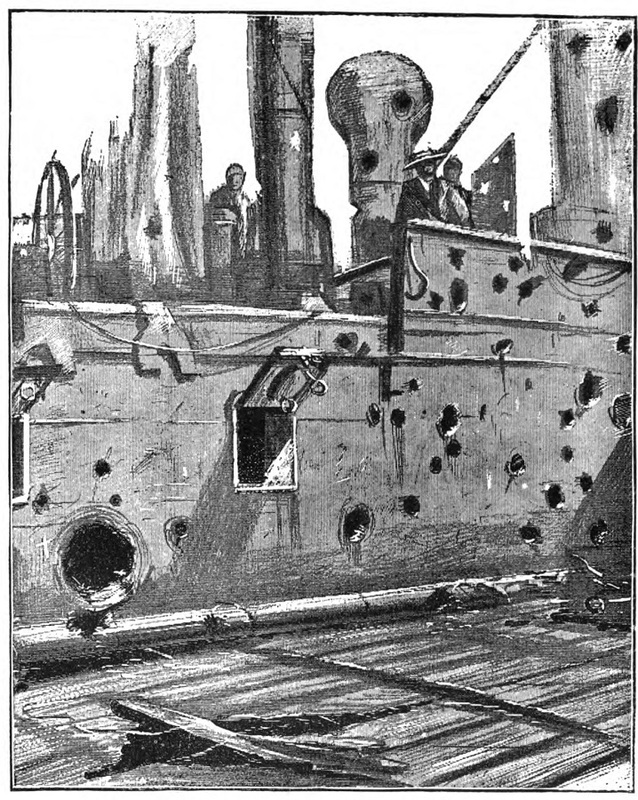 Some powers, such as the French, chose to mount their guns in turrets instead, but the British chose casemates because they allowed the guns to be hand-worked in the event of a power failure, and dispersed along the ship's side, making it less likely for a single hit to put multiple guns out of action. 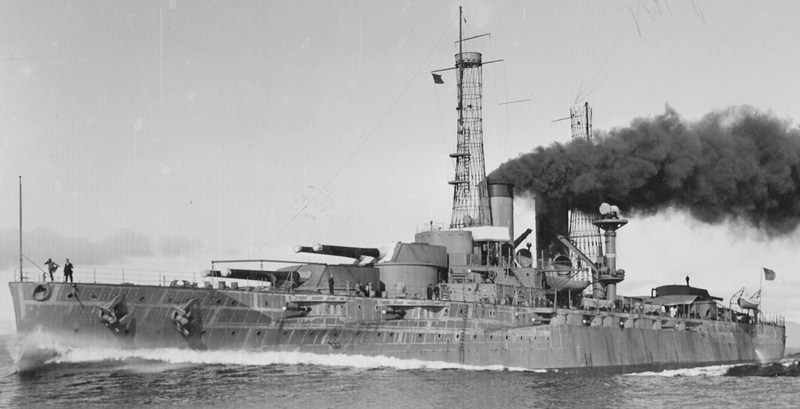 USS Texas on trials. Note the height of the bow wave. The casemates forward proved too wet, and were removed. The major disadvantage of the casemate mounting was that it was usually quite low in the ship, which made the mounts wet, and meant that water got in at high speed or in bad weather. This obviously hindered operations, and many dreadnoughts had various casemate-mounted guns removed due to excessive wetness.7 In later ships, beginning in British service with the King Edward VII class, the casemates were merged into a continuous belt to protect the ship more effectively, usually at the cost of most of the lighter protection from other directions. Confusingly, these are still often described as casemates, because they're visually indistinguishable and have the same problems as traditional casemates. 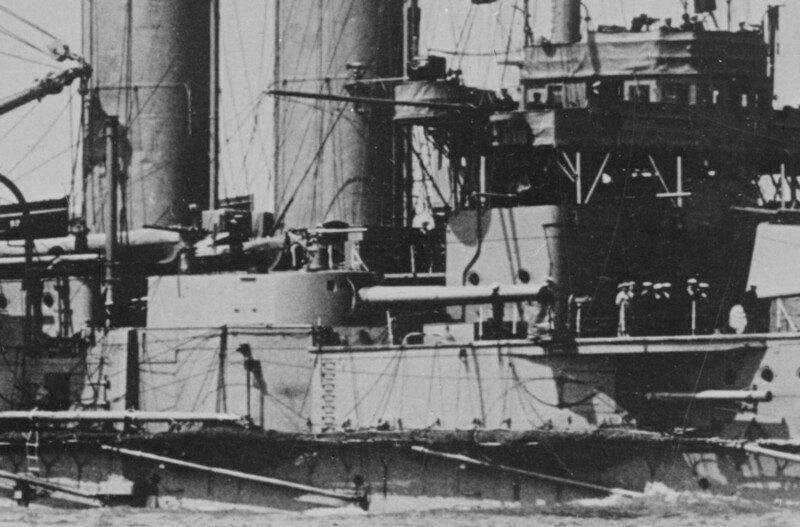 Starting in the early 1890s, the QF gun was seen as the dominant weapon of the battleship. Existing heavy guns took a few minutes to fire each round, while the QF battery could produce an impressive hail of shells. This impression was confirmed by the Sino-Japanese War, where the Japanese cruisers, armed almost entirely with QF guns, defeated the Chinese convincingly. Starting around 1900, they were dethroned by the heavy gun, first in the form of the 8" or 9.2", and later by the all-12" ship. There were a number of factors behind this shift. First, the rate of fire of heavy guns climbed thanks to the same improvements that had made the QF gun possible. Second, better armor metallurgy allowed designers to armor much more of a ship against QF fire. Third, improved fire control meant that a meaningful hit rate could be achieved at ranges great enough to limit rate of fire by the need to spot targets. The smaller shells also suffered at the increased range, their reduced velocity leading to smaller danger spaces and worse penetration. The QF gun wasn't entirely gone, though. The 6-pdrs had never gone away, and around 1900, guns in between them and the full-size QFs began to appear, usually in the 3"/12 pdr region. These weapons would remain and grow, even as Dreadnought swept away the classic QF gun. Do no naval guns incorporate the sort of systems for automatic loading of cartridges found in semi- and fully-automatic handguns and rifles? So even in the QF guns, firing one cartridge does not automatically cause the next to be chambered? Not in this era, no. Obviously, machine guns were fitted, but the technology for automatic loading didn’t stretch far enough to make it into the category I’m discussing here until after WWI. The biggest automatic weapons of the era were under 2″, which is only useful for shooting at torpedo boats, and thus kind of out of my scope. I'm more familiar with cannons designed for terra firma, but if you're talking about purely recoil or gas cycled weapons I can't think of any examples ever fielded much bigger then 50mm. There are plenty of bigger cannon designs that automatically open/close the breach and extract the casing, but they are all single shot. All the larger caliber, fully automatic cannons I know of are externally powered, either electronically or hydraulically. My thoughts would be that small arms inspired designs would be size and weight inefficient. There's also the problem that any platform big enough to mount a large caliber cannon probably has enough power for a separate loading mechanism, which gives you a lot more options in design. Yes, but think how cool an M2 sized up to take 8" shells would be. That should be worth at least three History channel specials! Also, it would put the fear of some deity into whoever is on the receiving end of 100 shells a minute or whatever rate of fire you get it up to. Cartridge length is going to limit cyclic rate as you can't have the mechanism moving too fast, maybe make it a revolver cannon. There's a definite limit on that kind of thing. At some point, it's just much easier and lighter to use an external power source. The closest thing to an 8" machine gun was the 8"/53s on the Des Moines class, which were able to fire at the same rate as a typical 6". I'm really looking forward to seeing the guns on Salem. Cartridge length is going to limit cyclic rate as you can’t have the mechanism moving too fast, maybe make it a revolver cannon. I thought about that. 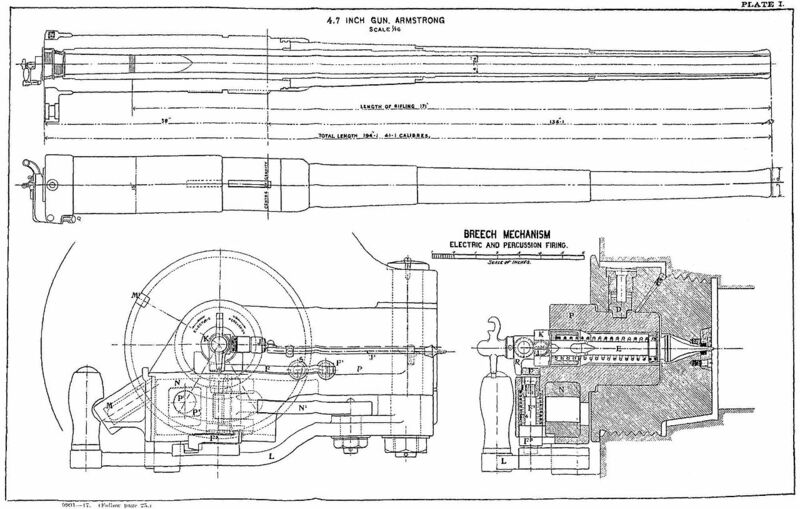 The M2 runs at 1200rpm, and is 1/16 the caliber of an 8" gun, with essentially WWI metallurgy and design. A 50bmg cartridge has an overall length of 5.45", so with a 5.5" stroke you would have similar linear speeds at 100rpm if you could get the cartridge length to about 66". With a properly proportioned shell, you could go up to 88" of length and a rate of fire of 75rpm. I'm sure there are a lot of non-linear factors that I'm neglecting here, particularly as regards cooling and heat buildup, but in principle I think you could make an 8" machine gun. There’s a definite limit on that kind of thing. At some point, it’s just much easier and lighter to use an external power source. Of course! This is very much an impractical thing. The Soviets managed to get even higher firing rates out of 30 mm aircraft cannon in conventional designs though probably with better metallurgy than what was available in WWI and it seems the lifespan of those cannons is less than western rotary or revolver cannons, during WWII their 12.7 mm machine guns managed a higher rate of fire than the M2 despite their cartridge having a longer casing (by 9 mm IIRC). Though with big guns you're probably better off spending the design effort on the mounts and fire control and put your effort into hitting the targets instead of rapidly missing. You're probably not going to be needing that caliber for anything agile enough to need rapid fire (though burst fire might be useful even if it takes a minute between 6 round bursts and if there are heat buildup concerns would be enough to solve them). Seems to me the use case for a rapid-fire large-caliber gun might be either area suppression or multiple round simultaneous impact bombardment. But for that I'm hard-pressed to think of a case where boosting the ROF much over 30 rpm per gun is a better investment than adding more guns, which pays dividends in the form of better resistance to damage or failure and makes it easier to employ different shell types in a single salvo. Thinking this over more, I have serious concerns about accuracy. Naval weapons are pointed quite precisely, and there's no way you'll be able to maintain that level of precision when you're using an automatic weapon, with lots of moving masses flying around. I think the idea would be more of an engineering feat than anything of practical utility. That being said, to the extent that high rates of large caliber fire are useful, it seems like naval fire support would be the clear use of it, not naval surface warfare. * If you really wanted to make it useful, you might also have something like a rate switch, where you can choose between a single aimed shot with the loading mechanism locked up, and higher rate less precise fire. *It also seems like something that would have made more sense back before precision guided munitions were a common and cheap thing. You'd need an awfully big target for that to be practical. Battleships are big. Probably as big or bigger than a typical fire support target, and naval gun patterns are on the same scale. So any pattern spread is probably going to mean that the shells just miss. I agree that using it would be rather hard, especially as a 100rpm rate of fire, even at 8", implies sending 33,000 pounds of shells downrange per minute, plus powder and the shell casing, so just the ammo feed would have to massive. It really seems like more of an engineering exercise than anything else. How accurate is/was WWII era naval gunfire? Wikipedia quotes the GAU-8 as having an accuracy of 5 mils, and that's from a plane mounted weapon with much tighter weight considerations and other design constraints. I think with decent further design and a more relaxed weight budget, plus a lower rate of fire, you could probably get it down to 2mils, though that's for direct fire rather than indirect fire, so I'm not sure what kind of CEP you would get. Nonetheless, 2mils is 3.2m/mile, or say 200' radius at 20 miles. This suggests that an aircraft grade M2 could do 20" circlesat 600 yards single shot, and 5' circles for 10 round bursts, after which barrel heating degraded accuracy significantly. This implies an accuracy of 7.5' radius per mile for short bursts. Obviously there are lots of non linear things here, and as you say it's rather impractical, but as an engineering challenge it's interesting. I think you could barely make it work for supporting a WWII era amphibious landing while using 21st century tech, but only barely. I get 4-6 mils during WWII, according to my sources. I think the Iowas did better in the 80s. I'm not sure the GAU-8 applies, because it's a Gatling. I'm surprised they're claiming 1 mil for the M2, but that's single shot. I’m surprised they’re claiming 1 mil for the M2, but that’s single shot. Yes, for single shot with everything locked down they appear to be on the level of a normal rifle, but I thought even the short bursts would be at least comparable. Accuracy degrades from a 20" circle to a 60" circle for a ten shot burst, again under ideal-ish conditions, but a 60" circle is still 15' per mile,, or about 3 mil. Operational accuracy would probably be half that, so say 6 mil? The bigger problem seems to be thermal degradation. Per that link, a 50 round burst has a 75' circle at 600 yards, or about 4500' at 20 miles, which is pretty useless. I suppose I shouldn't be too surprised that it was making 1 mil. Didn't Gunny Hathcock use one for sniping? But yes, the big problem I suspect is going to be longer-term performance. Easier and safer to simply use multiple barrels.